The concert at Piazza dell’Immacolata in the San Lorenzo neighborhood in Rome is inserted in the multiple reality of public space, where a multitude of parallel stories and people meet, discuss, play, sing, eat, come and go. This is why different groups and styles are positioned at different points, alternating classical, choral, gospel, pop and jazz, to reflect the diversity around us. The spatial array of the musicians and the apparent disorganization of the formation alter our way of listening: some musicians perform in the square, while others are at windows or on rooftops. The sounds mingle and move. The architecture of the buildings becomes more evident, creating a true set for this spectacle open to all who pass through the square. Set design by the architects Susann Vécsey and Christoph Schmidt. Music by: Klaus Badelt, Marco Cecilia, Georg Friedrich Haendel, Camille Saint-Saëns, traditional Irish music, gospel choirs, improvisation. 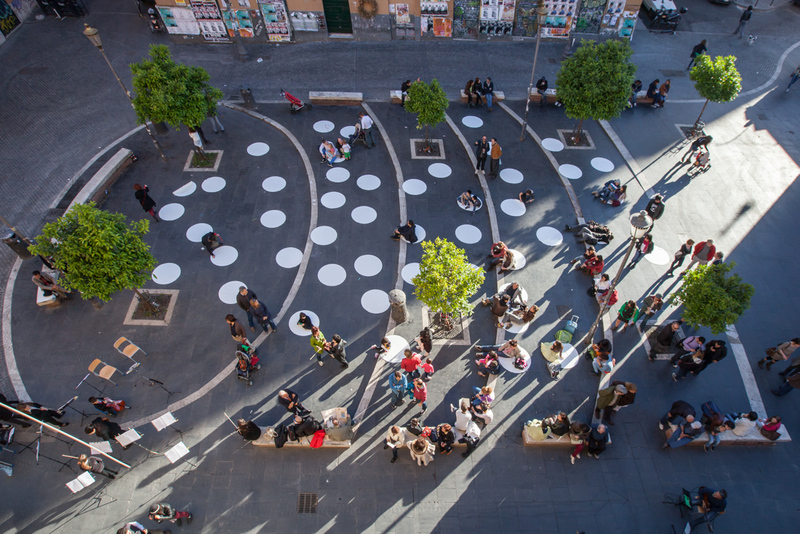 Susann Vécsey & Christoph Schmidt (CH): White circles with a diameter of one meter are arranged around Piazza dell’Immacolata. This aesthetic intervention attracts the attention of passers-by to the event in progress. At the same time, the circles offer a space in which to sit and listen. They can be moved and repositioned in the public space; they move freely, just like the musicians and the audience. Born in Florence, 1965. An eclectic artist, he plays the entire range of saxophones, clarinet, recites and sings. He began his studies with his father, a musician and musicologist, and then attended the IALS to study saxophone, voice, harmony, arranging for big band. He presently studies jazz vocals at the Santa Cecilia Conservatory in Rome. His training also includes courses in dance, pantomime, comic acting and clownerie. For over 25 years he has performed in Italy and abroad, in over 200 concerts at festivals, series and awards, as well as television, radio and theaters. He has published 14 albums, also as a composer and arranger, and at least 20 records as player, artistic director, soloist, singer and session man. He regularly conducts courses and lectures on saxophone, clarinet, solfège, gospel singing and ensemble music, as well as innovative courses on ear training and music for infants. Program: Improvisation. Born in 1999 in Rome, he began his musical studies at Priverno with Ilario Polidoro and Ildo Masi. He then took courses in Jazz Trumpet at the Conservatory of Frosinone, studying with Aldo Bassi and Marco Tiso. In 2012, with some young local musicians, he founded the jazz band The Blues’ Sons. Since 2011 he has played in the band Città di Priverno, participating in traditional processions and concerts (Island of Liri, Vatican City, Artena, Biella). He is first trumpet in the Orchestra Carlo Cicala, winner of second prize in the national competition for youth orchestras of Campobasso (2013) and first prize in the national competition of Arpino (2012). He is a member of the Orchestra dei Fiati Giovanile of Latium. In July 2011 he performed as trumpet soloist in the Petit Prince produced by the ateliers of the Festival Musica sull’Acqua of Colico (Como). Program: Improvisation. A project founded and directed by Marco Cecilia, SIAE author and composer, and teacher. The project began in 1999 under the name “Orchestra di chitarre Controchiave,” initially composed of over 20 guitarists, and then reached its present formation as a quintet with Marco Cecilia and Giovanni Mascherucci on electroacoustic guitar, Guglielmo Oria on electric and baritone guitar, Cesare Costantino and Nicola Nosengo on classical and baritone guitar. The repertoire is varied and includes original compositions and reworkings of pieces selected from a wide range of apparently distant musical contexts, from Bach to Astor Piazzolla, Queen to Dave Brubeck, Pat Metheny and Jethro Tull. The group has performed widely in venues and festivals, mostly in the Rome area, such as the Giornata della Musica 2008 at the Auditorium Parco della Musica, the 2002, 2004, 2008 and 2011 editions of the Festa per la Cultura, and at Invito alla Lettura 2012 at the Biblioteca Comunale P. P. Pasolini. He completed his classical studies with Francesco Taranto and explored the modern language with Fabio Zeppetella and Enrico Bracco, also attending seminars conducted by Frank Gambale, Tommy Emmanuel, Robben Ford, Scott Henderson, Europa String Choir (study of the New Standard Tuning of Robert Fripp) and others. A SIAE composer and professor at many schools, he has published scores and the pedagogical text “Strumenti per il chitarrista” with the Erom publishing house. Founded in January 2005 with the aim of combining and reinforcing the varied teaching experiences of the musicians Simone Genuini, conductor and pianist, Roberto Nobilio, clarinetist and pianist, Valeria Bosso, violinist, Gabriella Pasini, violoncellist. The orchestral group joins more advanced students with children in their first months of study, and from an initial group of fifteen it has expanded to the present formation with seventy players and ten teachers, including the founders and guests. The orchestra does many benefit performances, including the annual concert on 8 November for ASM (Associazione Studio Malformazioni), dedicated to Margherita Nobilio, who lived only sixteen days due to a malformation of the heart. Past performances include the concert in 2011 at the Festival of Salzburg Cantus Salisburgensis, when the orchestra performed at the Mozarteum, the Mirabell Gardens and the Salzburg Cathedral. The teaching staff of the orchestra is composed of Valeria Bosso, Stefania Cassano, Roberto Nobilio, Gabriella Pasini. Degree in clarinet from the Conservatorio Francesco Cilea of Reggio Calabria. Winner of the international competitions Città di Capri and Città di Moncalieri, with an intense performance schedule in Italy and abroad. He has participated in the Concerti del Quirinale, the jazz festival Roccella J., the Mozarteum Argentino and in Salzburg, and toured in Chile, Uruguay, Argentina, Greece, Portugal, Austria, Hungary, Lithuania and Turkey. He has appeared on radio and television programs for RAI, Radio Vaticana, and in Argentina, Chile, Greece and Lithuania. Since 2004 he has taught music at the Ospedale Bambino Gesù of Palidoro and Policlinico Umberto I of Rome, where he has invented and implemented the therapy project “Uno dei fiati,” in collaboration with the Regional Cystic Fibrosis Clinic of Latium. Program: Traditional Irish, The Wind that Shakes the Barley; Georg Friedrich Haendel, Minuet from Water Music; Camille Saint-Saëns, Tortoises, from the Carnival of the Animals; Klaus Badelt, Pirates of the Caribbean. A vocal ensemble that has performed many concerts over the last five years for humanitarian causes, raising funds for non-profit organizations. The repertoire is mainly gospel, but also includes a range of different original compositions. The choir is conducted by Sebastiano Forti and composed of a minimum of eight and a maximum of twelve singers, backed in the original formation by the rhythm section of Santo Tringali on pianoforte, Mauro Gavini on double bass and Giulio Caneponi on drums. The group recently worked on the soundtrack of the film that won the Golden Bear at the Berlin Film Festival 2012, “Caesar Must Die”, directed by Paolo & Vittorio Taviani. Program: Joshua Fought the Battle of Jericho; Nobody Knows the Trouble I’ve Seen; Shalom; Amen. They founded their architecture studio ‘Vécsey Schmidt Architekten’ in Basel in 2007. Besides projects for buildings and competitions, they also work on architectural theory.